8 WEEK BOXING COURSE for beginners starts Tuesday Nov 13th. This 8/week specialty course is open to students in Ohana’s Kid’s BJJ program as well as their parents. 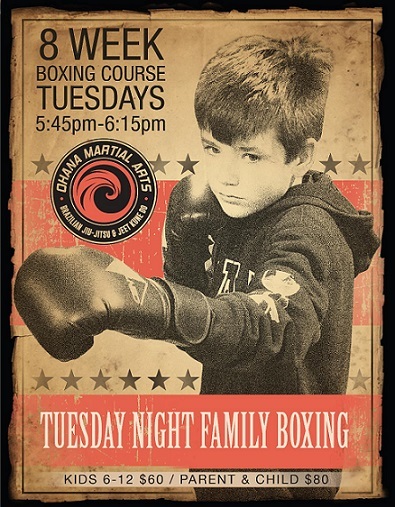 Come learn the “Sweet Science of Boxing” in a fun, safe, and structured 8 week course. Sign-up your child, or make it a fun family experience together. Absolutely no experience needed! Sign up at the Ohana front desk. Space is limited!